Some days, the momentum of life feels up hill. The smallest amount of pressure feels like too much. The words coming out of other’s mouths seem like they’ve got nails on them. Silence would be much preferred. And energy? Well you might as well feel like Wesley from the Princess Bride, after he’s been tortured by electrocution and left nearly lifeless lying on the table (how nice he had friends who came and rescued him and carried his unwilling body wherever they needed to go!). And today’s culprit? Physical pain. For many years, I’ve suffered from pain and inflammation in my body. I’ve seen doctors and a few naturopaths, changed my diet and used essential oils. There have been stretches of relief here and there. But not a ton of concrete answers. Whenever I get a “break” from the pain, I’m more thankful than the wrongfully accused being pardoned. Relief isn’t the word for it. I’ve had a flare up on and off for about a month now and last night I felt pushed to the point of discouragement. I’ve been here before for sure. It’s an understatement to say your very faith is put through the fire when you’re suffering from chronic pain, illness or disease. And physical pain has a strange way of casting a shadow, creating confusion about reality and making you feel like there’s no way out or through. The tantrum-y me says I don’t want this pain to be in my life. I don’t want anything to do with it. I don’t want it to be used in my life to change me or help others. I just want it gone. But the deep, strong core of me wants to surrender gracefully to the process and endure. And maybe not just endure, but perhaps even thrive… I want to be reliant on Him to make me strong when my mind and body feel frail, to lift my discouraged spirits and give me hope, to open my eyes to His presence when all I feel is terribly alone. I took this sweet picture of my 15 month old this morning. She’s our spunky, full of joy, third child who seems to us a mini energizer bunny. I shouldn’t be, but so often I’m surprised when she gets fussy and starts crying in her carseat, when I KNOW she is exhausted. “Why doesn’t she just fall asleep?” I ask myself. 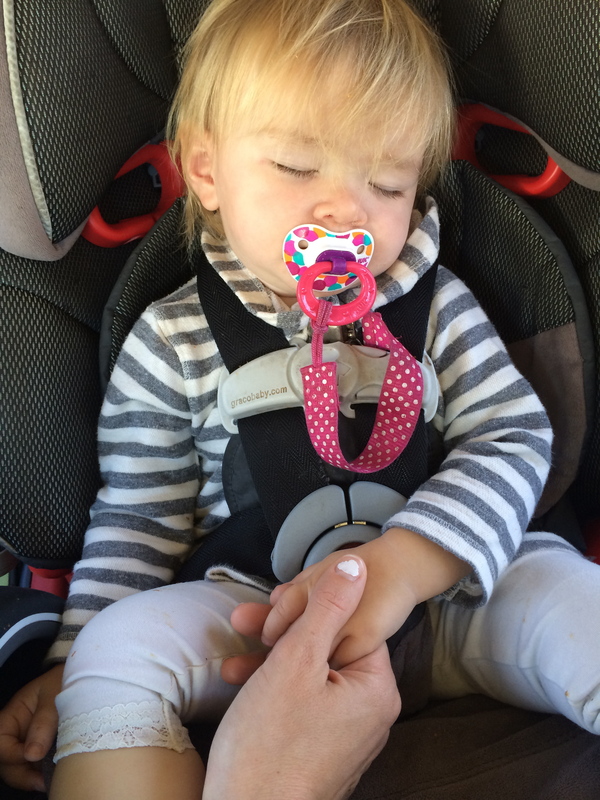 Equally, I’m surprised how instantly she calms down when I reach back and simply hold her tiny hand in mine. She’s asleep before I know it. I don’t have a lot to offer… but I wonder… can I be that voice for you today? Next > Letter to Me: Can I Tell You Something?